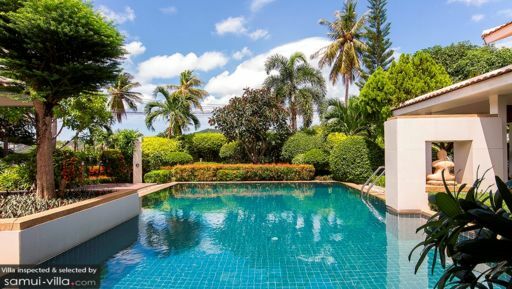 Villa Baan Arun is a charming four bedroom private garden paradise situated near some of the island’s top spots such as the happening area of Chaweng and the relaxed seaside Fisherman’s Village. With its serene vibe and pleasant wooden interiors, you’re sure to have a calming vacation stay here at the villa. The guest manager and private chef will make sure that your stay is a truly enjoyable one. Come and have a great holiday with us here at Villa Baan Arun! With their white washed walls, wooden floors, and airy features, the four guest bedrooms here at Villa Baan Arun are sure to give you some good night’s rest. All bedrooms have air conditioning units and have either king or queen size beds. The first two bedrooms have private ensuite bathrooms, while bedrooms three and four have a connecting ensuite bathroom with a pebble bathtub perfect for evenings when you want to pamper yourself just a little bit more. The outdoor spaces here will make you feel like you’re staying in a garden oasis. With a private swimming pool and a comfortable cloth covered lounge area by the pool deck, you can spend a highly relaxing afternoon outside. In the evenings, you can take your dinner by the pool on the white wooden chairs and table on the small patio. The garden will make your evening seem more romantic. 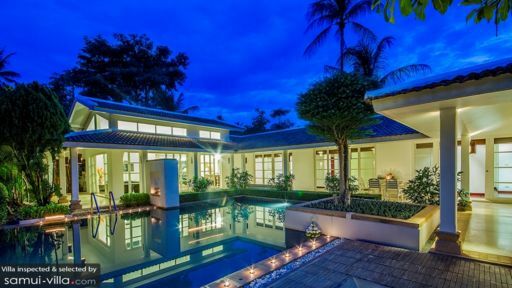 Villa Baan Arun has an open plan living area where the kitchen, dining, and living are. From the bedrooms, you’ll pass a wooden floor corridor that is lined with sliding glass windows, giving you a good view of the relaxing pool and garden area. From there, you’ll arrive in the living area, which is fan cooled and also has air conditioning units. Guests can lounge on the sofa while watching TV or spend some time in the kitchen whipping up some good meals before consuming them in the four seater dining area. What makes this living space extra airy are the glass doors surrounding the living room, where the view of the garden and pool area will certainly calm you. While the accommodations are charming and have a homey vibe, the staff here at Villa Baan Arun will only make your stay even more pleasant. There’s a Guest Manager, who speaks a handful of languages, and will help you with your various needs and activities.A private chef can help serve you some delicious meals. Security is hard at work twenty four hours a day ensuring your stay is safe and hassle free, while a twice weekly maid service will make sure the villa is spick and span. Lastly, upon your arrival, you can peruse the welcome pack with some recommendations for your stay. 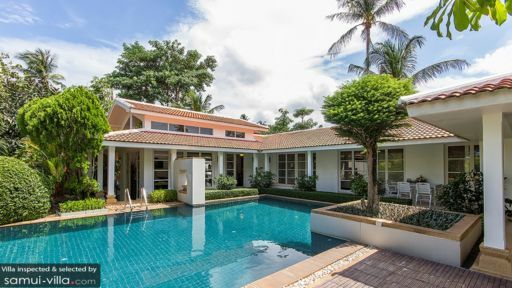 Located in Bangrak Beach on Koh Samui, Villa Baan Arun is near Chaweng, the island’s busiest area with its variety of restaurants and bars.Bophut and the famous Big Buddha are also nearby, only a ten minute drive away. The charming Fisherman’s Village in Bophut is a five minute drive away, a good area if you’d like to spend a leisurely afternoon browsing some shops and restaurants. Of course, Bangrak Bay is also a good place to get some fresh air. Villa Baan Arun is perfectly situated for those who want a quiet seaside vibe while being near some of the island’s top spots.